How everyone! How’s it going? After an indulgent Monday with a Five Cheese Beer Mac-n-Cheese I figured a lighter recipe was in order. All about balance, isn’t it? This one comes to you a day late (because I was completing some site layout changes), but better late than never! Plus, I kinda wanted to say hi before the upcoming weekend! 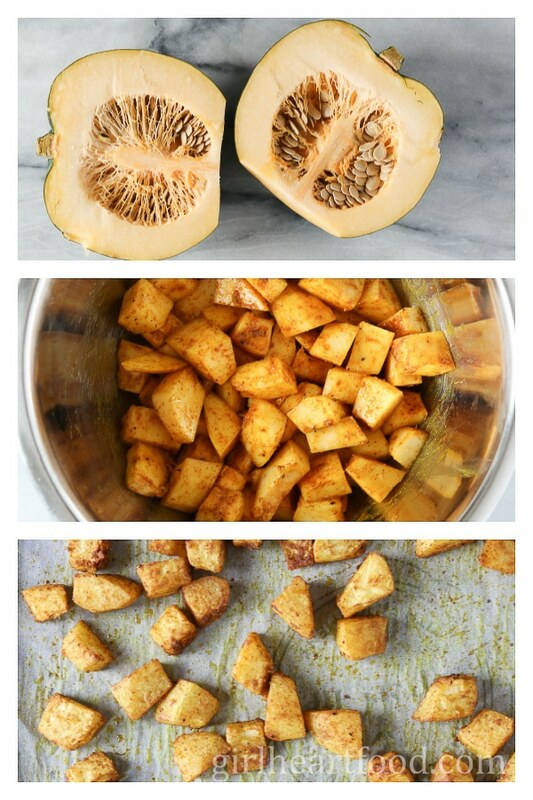 Have you ever used acorn squash in a recipe? It’s simple to prepare and what makes this one extra special is the addition of curry powder. It adds a lovely flavour and warmth to the recipe, which compliments the sweetness found in the pomegranate. Carefully cut the acorn squash in half. Scoop out the membrane and seeds. If you want, reserve the seeds for roasting to enjoy as a snack later (delicious tossed with some olive oil and spices). Cut into cubes and toss with oil and seasoning. Place on a parchment lined baking sheet and bake for about 40 minutes on 350F. Easy right? You can’t just bite into a pomegranate…well, I suppose you can, but it is definitely not recommended. The easiest way to peel a pomegranate? Cut it in half, get a bowl of water ready and invert the pomegranate into the water and press the arils out. They are not all going to pop out perfectly, but it’s the easiest (and cleanest) way, in my opinion, to get those suckers out. Usually, any of the membrane that surrounds the arils floats to the top, while they stay to the button. Easy peasy, right? Don’t have kale? Spinach or chard works great too, but the spinach won’t be as hearty. Want to use butternut squash instead of acorn squash? Go for it! Don’t have pomegranate? Dried cranberry will work in a pinch. I’ve eaten this wild rice salad both warm and cold and it’s great both ways. If you want to add a little more substance to the mix, some grilled or baked chicken would work great! 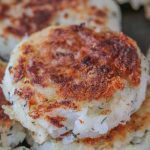 I love making this one on Sunday to have as a quick go-to side for lunch or to go with busy weekday dinners. Cook rice per package instructions. I used a gluten free wild rice blend. Meanwhile while the rice is cooking (mine took 40 minutes), roast acorn squash. To prepare squash, preheat oven to 350F. Toss squash with curry powder, 1 tbsp. of olive oil, 1/4 tsp each of salt and pepper. Place on a parchment lined baking sheet and bake for 40 minutes, tossing halfway. On the stovetop on medium heat, add remaining 1/2 tbsp. of olive oil and cook garlic 1 minute. Add kale, 1/4 cup of water and remaining 1/4 tsp each of salt and pepper. Cook kale about 5 minutes. 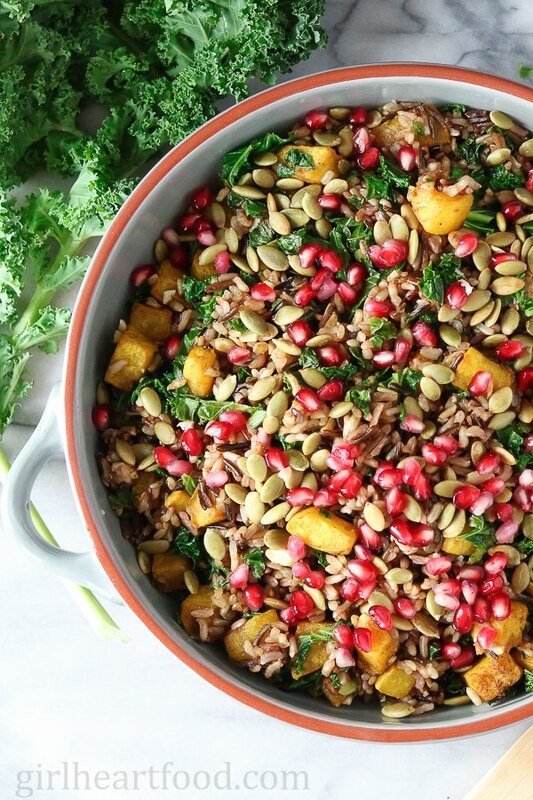 In a large bowl combine cooked rice, roasted acorn squash, and kale (and more salt, if desired. For my tastes, I didn't add any more). Toss to combine. Garnish with pumpkin seeds and pomegranate arils. Delicious warm or at room temperature. Enjoy! I love absolutely everything about this salad! Great way to use up rice leftovers. Haha – good idea 😉 Thanks Aryane! I discovered the water-trick method to peeling a pomegranate last year, and BOY was that long overdue! Too many stained articles of clothing happened before that discovery!! I love the idea of pom in a salad, especially with all of those other yummy ingredients. This is totally one salad I could dig! Cheers Dawn! Yep! I hear ya about the juice going everywhere, lol! Thank you so much, Katherine 🙂 Have an awesome week! OMG I want this on Thursday! Such a perfect Thanksgiving side! I love adding pomegranate to everything this time of year because they’re just so festive. I hope you had a great weekend, Dawn! The colors of this salad are gorgeous! I’ve never used squash in a salad. I’ll bet it adds a ton of flavor and extra nutrition too. I think this salad sounds like a winner through and through! Your salad is gorgeous! I don’t know why I haven’t thought to use wild rice as a base for salad before, that’s such a great idea! Pinning this for later. Dawn, this salad looks amazing!! And all of those colors are just fantastic in these photos! This is just the type of salad I love prepping on Sunday for a week of lunches. And I haven’t cooked acorn squash in a while, so this is the perfect motivation. Have a great weekend!! Thanks so much, Leanne 🙂 Happy to hear that! Have a lovely weekend too! This is beautiful! I can almost taste how delicious it is. Oh my! I’m pinning this for later! I love pumpkin seeds! Could you also use the squash seeds from the acorn squash? Are they edible?